FLORENCE, Ala. – The George Lindsey UNA Film Festival will host a music supervision panel as part of this year’s festival events. The panel will discuss the use, importance and creation of music within the film and television media. The panel will be moderated by Grammy Award winner and University of North Alabama Alumnus, John Paul White, and will be held on Friday, March 6, at 7p.m., at the Mane Room, 310 N Pine St.
Dave Jordan - founder of the music supervision company Format Entertainment based in Hollywood, California, who has worked on all of the Marvel films, which includes The Avengers, Thor, Thor: The Dark World, all three of the Iron Man films, both Captain America films, and most recently Guardians of the Galaxy. Jordan recently won the Guild of Music Supervisors award for best music supervision on a film over 25 million for his work on Guardians of the Galaxy. Julianne Jordan - music supervisor for Format Entertainment who has collaborated with Doug Liman on each of his films including The Bourne Identity, Mr. & Mrs. Smith and most recently The Edge of Tomorrow. She was also the co-executive music producer for Pitch Perfect. Andrea von Foerster - music supervisor whose work includes 500 Days of Summer, The Cabin in the Woods, Begin Again and Chronicle. Von Foerster recently won the Guild of Music Supervisors award for best music supervision on a film under 10 million for her work on Begin Again. Thomas Golubic - music supervisor, DJ and music producer whose extensive work in television includes, Six Feet Under, The Walking Dead and Breaking Bad, for which he was nominated for a Grammy. 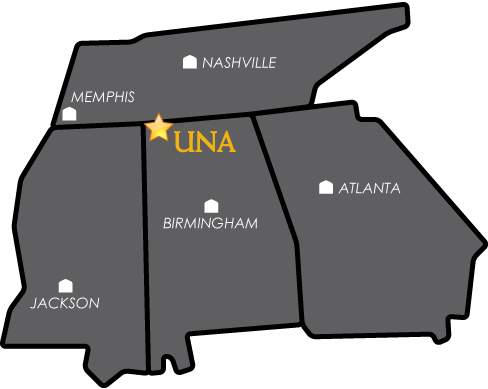 The George Lindsey UNA Film Festival is one of few film festivals hosted by a university. The event was founded in 1998 by UNA alumnus and celebrated actor and entertainer, the late George Lindsey. Lindsey’s own film career included several important roles, most famously the character Goober Pyle on “The Andy Griffith Show.” For more information about the festival and its related events please visit the festival web site at www.lindseyfilmfest.com, email lindseyfilmfest@una.edu, or call 256-765-4592.